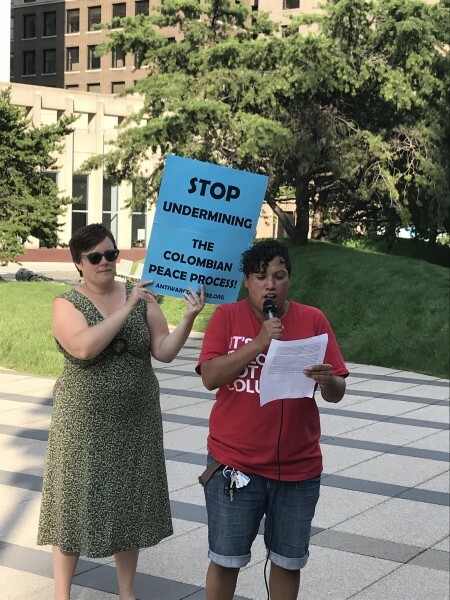 Minnesota joins International Day for Peace in Colombia | Fight Back! Minneapolis, MN - On August 7, international solidarity and immigrant rights activists protested during rush hour in front of the Federal Building in downtown Minneapolis as a part of an international day of protest to draw attention to the escalating violations of the Colombian peace accords. The peace accords, signed in 2016, are an attempt to end a 52-year civil war in Colombia. The MN protest was one of 83 solidarity protests in 17 countries. August 7 was chosen as the international day of action because it marks the first day of Ivan Duque’s term as the new president of Colombia. Duque’s election was marked with systemic violence against leftist candidates and many voter irregularities. One of Duque’s main champions is former President Uribe, who has known paramilitary ties, and together they actively spoke out against the Colombian peace accords. families have escalated to a rate of more than one person killed per day. Signs and chants focused on the role of U.S. aid in fueling the civil war and undermining the Colombian peace process. The protest was co-sponsored by the MN Anti-War Committee and the MN Immigrant Rights Action Committee. For more information on the international call for action go to https://afgj.org/days-for-peace-in-colombia.